Granted each triennium to one graduate student of Spanish/Hispanic Studies who is a member of Sigma Delta Pi and who has demonstrated outstanding achievement in coursework completed and exemplary involvement in extra-curricular activities as related to Spanish/Hispanic Studies. This award is a joint recognition by Sigma Delta Pi and the Asociación Internacional de Hispanistas. The completed “Nomination Form” and all specified supporting materials must be submitted via e-mail by May 1, 2019. Incomplete nominations will be disqualified. Selection of the award is made by a committee comprising leaders from both Sigma Delta Pi and the AIH with Sigma Delta Pi’s Executive Director serving as chair. Nominees are selected upon the basis of academic achievement in graduate courses completed and extra-curricular involvement as related to Spanish/Hispanic Studies. 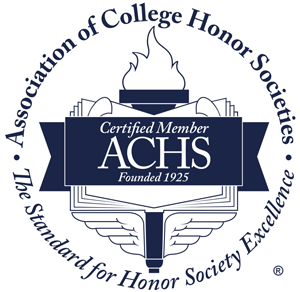 Sigma Delta Pi provides the award plaque, and the AIH will provide complimentary AIH membership for one term (a triennium) to the winner if he/she is not already a member of the AIH. Both SDP and the AIH will also provide the latest edition of the María Moliner Diccionario de uso del español. The 2019 awardee will be recognized during an appropriate venue to be determined. *This inaugural award was granted in summer 2016.